With R7A fitted you get two similar input stages with individual gain pots that mix together at the output, like in a 5F6 or classic Marshall amp. Two Cliff-style jack sockets can be mounted on the PCB in an over-under configuration, or you can just free wire onto the PCB. You can use a mono or stereo jack (stereo shown in the photo) but you really only neede mono of course -the extra stereo pins aren't connected to anything. 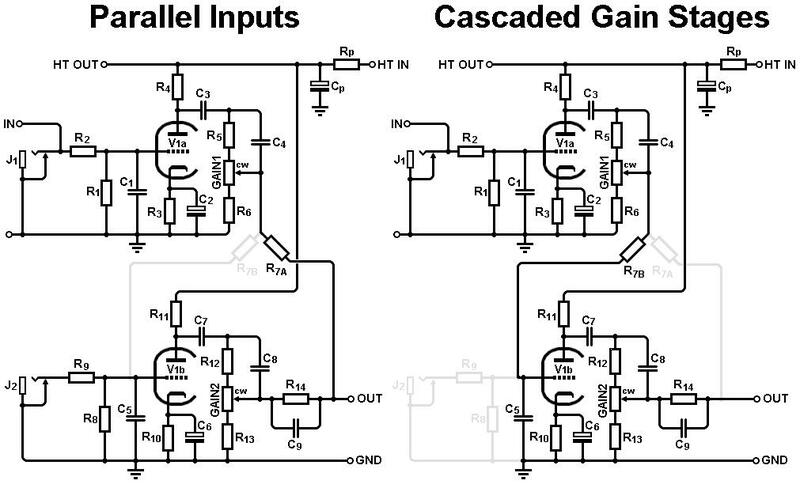 Spaces are provided for the traditional 'bright' caps, as well as end-stop resistors to allow you to tweak the gain ranges of the pots. 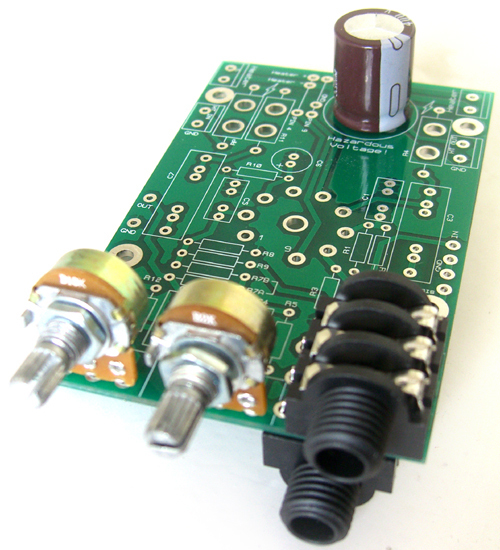 With R7B fitted you have one input (J1) and two cascaded gain stages each with its own gain pot. Of course, you don't have to use the pots if you don't want to, you can just jumper across the pads to create ordinary, passive interstage-dividers, or whatever you like. If you don't want to use a jack socket because you're using the PCB as an intermediate stage in a larger amp design you can inject the input signal to the solder pad labelled 'IN', which lines up with the 'OUT' pads on my other PCBs. The circuit is shown below in its two main configurations.